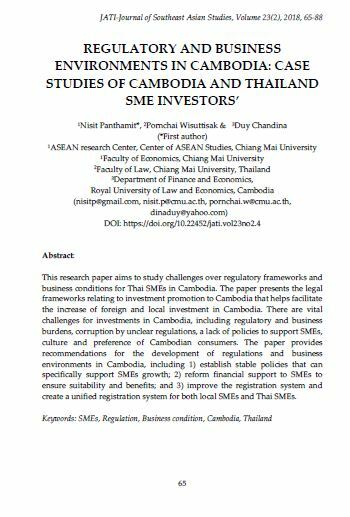 This research paper aims to study challenges over regulatory frameworks and business conditions for Thai SMEs in Cambodia. The paper presents the legal frameworks relating to investment promotion to Cambodia that helps facilitate the increase of foreign and local investment in Cambodia. There are vital challenges for investments in Cambodia, including regulatory and business burdens, corruption by unclear regulations, a lack of policies to support SMEs, culture and preference of Cambodian consumers. The paper provides recommendations for the development of regulations and business environments in Cambodia, including 1) establish stable policies that can specifically support SMEs growth; 2) reform financial support to SMEs to ensure suitability and benefits; and 3) improve the registration system and create a unified registration system for both local SMEs and Thai SMEs.